Call to Action following youth beating. Call for Leadership. In today's SunTimes, Stella Foster's column is a "CALL TO ACTION". The article says "where was the security at the Agape Youth Center? ", "where were the police? ", "where were the parents? ", and "what are the schools doing to keep kids safe?" Above is the map the T/MC created to show where this tragedy took place. You can read the story that goes with this on the Mapping for Justice blog. I ask, where are the business leaders, political leaders, faith leaders, media, hospital and university leaders? What are people in the suburbs doing, who drive past these poverty neighborhoods every day as the come and go to work? If you read the articles I've written on this blog, I've been asking for this type of leadership for many years. This is the front page of the SunTimes in October 1992, when Dantrell Davis was killed as he walked to school. How many times in the years since then have leaders and media been pointing to places where volunteers and donors could be surrounding kids with different hopes and aspirations and future opportunities than what they see modeled in their neighborhoods? Not enough. What are the media doing to point readers to resources they can use, every day, to help programs like Agape have the funds needed to pay for security, or to even operate in these neighborhoods? Other than getting involved with a few high profile programs, where else are readers being pointed to by this article? If it included a link to the Mapping for Justice blog, or the Tutor/Mentor Program Locator, the article could have been teaching people to use maps to choose what part of the city they want to get involved with, and what programs in each area they want to help with time, talent, and DOLLARS. If the media were pointing to the maps, and strategy maps that show actions leaders can take, and long-term goals of their involvement, then the stories would lead to more and better involvement in all neighborhoods where poverty breeds the type of violence that randomly appears in the city throughout the year. In advertising and religion, leaders know they need to communicate every day to potential customers, and they need to draw those customers to stores, churches, temples, and mosques in many places. Surely we can teach leaders that if we want to change what is happening in inner city neighborhoods we need to put non-school programs in multiple locations, and use advertising and other store-support strategies to draw volunteers and donors and good ideas to every one of these places on an on-going basis. Who can help us get this message out more often? Who can help us find the money to keep making these maps, and publishing this blog? We have several videos on our web site, created by students and volunteers and other friends. They all show our kids and volunteers and tell a bit about why your help is needed to find the dollars needed to offer this program. Here's one. You can send donations to Cabrini Connections, Tutor/Mentor Connection, 800 W. Huron, Chicago, Il. 60642. We're a 501-c-3 non profit. You can also go to places like this and this to give donations. I'm a proud "tutor/mentor papa"
I first started volunteering as a tutor in 1973. The first, and only, student that I've ever been matched with was Leo Hall, who was in 4th grade at that time. We have been connected to each other ever since. He just sent me this newspaper article, showing that he was in Elgin to judge a film festival this weekend. The article talks about a movie he made about the murder of a homeless girl from Elgin. He used Cabrini Connections space a couple of years ago when he was doing the casting for the movie. I'm proud of you Leo. I hope you win an Oscar some day. How about some of you making a donation to recognize the 35 years that Leo and I have been connected because of the tutor/mentor program started at Montgomery Ward back in 1965. This was Leo and me around 1974. I've been connected to the National Network of Libraries of Medicine for many years with a goal of connecting public health leaders with tutor/mentor program strategies. Here's an article they posted today on their blog to encourage members to participate in the May and November Tutor/Mentor Leadership and Networking Conferences that we host in Chicago. Can you do the same and share this message in your network! I spent most of the day Saturday at the Morgan Park Church of God, located on the far South Side of Chicago. On Friday, I posted a map of Roseland, listing five youth serving organizations. On Thursday afternoon, another Chicago teen was beaten to death, as part of a gang fight, right outside of one of these agencies, Agape Community Center, 342 W. 111th St., . Read the follow up story in the Chicago SunTimes. 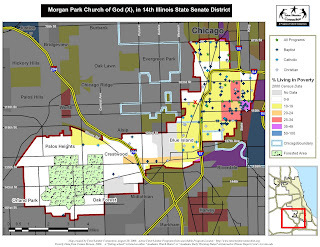 Below is a map showing the location of Morgan Park Church of God, just west of I-57, within the 15th Illinois State Senate District. This church is just West of Roseland. Further west are more affluent communities and more faith groups who could be mobilizing volunteers and donors to support the growth of volunteer-based tutor/mentor programs in Roseland, Englewood and other South Chicago neighborhoods. Voters in these areas could be judging elected leaders based on what they do to help such programs grow, if maps like this were used to show change over time. Anyone can be using the ideas in the Tutor/Mentor Institute to build their own leadership strategies. I went to this health fair at the invitation of Rev. Jonathan Hall, of Vernon Park Church of God. My goal was to continue to reach out to faith leaders, to help them create communications strategies that would draw more people from faith communities in the city and suburbs, to information that would help them learn where, and how, they could be involved in helping volunteer-based tutor/mentor programs grow in high poverty areas. While there was not a huge crowd, this was a successful network-building event for me. 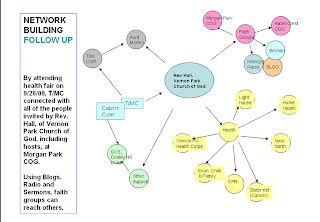 The map below illustrates the different people and organizations that I connected with because of this invitation and my willingness to give up my Saturday for this event. One of the people I met was from Aunt Martha's Youth Service, and had attended a Tutor/Mentor Conference in the past. Others were from different types of health care providers, and from the host church, Morgan Park Church of God. In each case, my goal was to introduce the T/MC, and point out ways that the people I meet can begin their own leadership and network-building strategies, so that people in health organizations, faith groups, business, and politics, would be more consistently involved in learning ways that people can use time, talent, and limited dollars, to build programs that connect youth with more positive mentors, and non-school learning and enrichment, so there are fewer youth becoming involved in the tragedies that we keep reading about in the paper. Here's a follow up map that I created and will be sharing with the people I met on Saturday. It shows a 12 month schedule of communications, outreach, and networking at events such as the Nov. 19 and 20 Tutor/Mentor Conference. Imagine if dozens of faith groups that are not located in poverty were using this strategy to engage the members of their congregations, and the places where faith members work. That's our goal and we'll be happy to meet with anyone who'd like to discuss ways they might build such a strategy. Tomorrow I'll be at the Morgan Park Church of God, 11153 S. Hoyne, in Chicago for a Chicagoland Area Ministries Health Fair. If you're in the area, I hope to meet you. I created the map below to show the locations of organizations listed in our database for that area. I see five. 1 . Agape Community Center - S.A.Y. Yes! We're never completely sure these organizations are still operating, or that others don't also operate in the area, because we're dependent on getting information updates from the programs themselves, or from people in the area. If you're in the area, why not join us and tell us about your program. If you want to create a map like this, just visit the Program Locator and enter your zip code. You can also use the interactive version and zoom into a section of the city to see if there are any programs. Unrestricted grants for non profits - yea! Here's an article talking about how the Boston Foundation has announced a change in its grant making policy, and will now "emphasize unrestricted operating support. What's it like to lead a non profit? How strong is our sector? Brice Royer is the founder of TCKID, a non-profit. This blog article provides a summary of the Meyer Foundation Report, which is a survey of more than 5000 non profit leaders. "You're Different. You Get Things Done." This was one of the best complements I've received. It was from Paul Vallas, CEO of Chicago Public Schools. He was reflecting on my ability to move quickly to implement our ideas while his huge bureaucracy moved much slower. 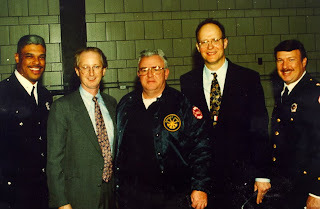 This photo was taken when we held a Conference at the Chicago Fire Department and Vallas was a keynote speaker. I was reminded of this again when I read about the $30 million CPS wants to spend to help high risk students. No matter how good the ideas are, or how important, executing them in such a huge system will be much more difficult. I've never had $30 million. In fact in 1992 when we decided to "create a database of the tutor/mentor programs in Chicago and try to create more frequent advertising to draw more consistent resources to all of the programs in the city" we had no money. We were just seven volunteers. In the years since then, we raised $50k in 1993, $114k in 1994, $214k in 1995 and each year increased our revenue until 2000 when we raised nearly half a million dollars. 40% of this money was spent to build the Cabrini Connections program, and 40% was devoted to the Tutor/Mentor Connection. The rest was the cost of finding the money, and providing administrative services. In 2001 our revenue went down to $350,000 and stayed in that range until 2006. Since our first host and benefactor, the Montgomery Ward Corporation had been providing us free space and utilities until they went out of business in 2000, this meant that we've been paying for these things since then (and without the $40,000 donation each year that Wards had given us since 1993). Nearly 30% our annual budget just goes to cover space, utilities and insurance. Thus, we've never had more than $200,000 in a single year for the Tutor/Mentor Connection, which aims to help tutor/mentor programs reach youth in all poverty neighborhoods of Chicago. Compare that to the planned $30 million CPS is targeting toward less than 300 teens. So when Paul Vallas says, "we get things done" he means we do a lot with very little and what we do has a huge impact per dollar in the third largest city in America. While we don't have the resources big companies, or CPS have, we do have a flexibility and nimbleness that they don't have. When people told us in 1994 they would come together for a conference, we asked other programs to volunteer their expertise do do workshops, and we hosted the first Tutor/Mentor Leadership and Networking Conference in May 1994. When people told us the appreciated the printed list of programs we provided at the first conference, we began printing our list of programs as a formal Tutor/Mentor Directory which we sent to all programs, schools, libraries, and many businesses and foundations. When we ran out of money to print and mail the directory, volunteers helped us create the on-line program locator which is available to more people every day than the printed directory ever was reaching. We've listened to the needs of tutor/mentor programs, including the needs we recognized in our own Cabrini Connections programs, and we've tried to innovate solutions. In the Tutor/Mentor Institute we're sharing ideas that will only be achieved if other people volunteer time and talent and dollars. Yet because we do that, we find volunteers from all over the world. Some of the animations on our web site were created by interns from Korea, Hong Kong and India. The on-line documentation system (OHATS) was rebuilt in 2007 by a volunteer in Baltimore with the work being done by his company in India. If you have a vision, and you share that with other people, and don't have much of a bureaucracy, you can do a lot with the few resources you do have. Thus, my proposal to CPS and other bureaucracies around the country is that you provide some resources, and some talent, and your own leadership, and enable us to work parallel to you. 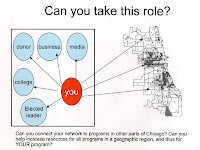 If we can innovate new ways to get volunteers and donors involved and in locations throughout a city like Chicago, you can apply these ideas in your own leadership, so more people respond. You are not liable for the mistakes we make, or what does not work. We are. You can just take advantage of what does work....or help us make it work better. I encourage you to read this article, posted today on a PCWORLD blog. It profiles a list of people who Phil things are deserving of the MacArthur Genius Award. The first name on the list is me, Daniel F. Bassill. I've known Phil for a long time. I met him through the networking and information sharing I've done on the Internet since 1998 when I was first introduced to the web. I was honored when he first suggested to me that he was going to write this article. I thank him for taking the time to recognize myself, and others, for the work we're doing. 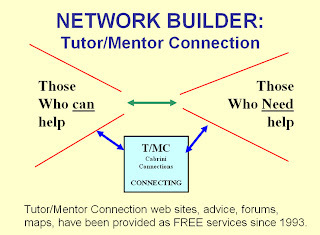 This type of network building is really the core concept of the Tutor/Mentor Connection strategy. As more and more people look at the information on our site, or become involved with youth via their own tutor/mentor program roles, the can all reach out to people in their own networks with stories of what they do, and what is happening in other tutor/mentor programs. If enough people do this every day, we'll all have the resources we each need to earn praise from people like Phil and awards from foundations like the MacArthur Foundation. However, we've not won the award. You can change that if you share this article with enough people. Or, we won't need the award, if others read Phil's article and decide that they want to be the benefactor that supports our innovations. Sept. 9 shooting - "kid you would wish for"
Page 13 of today's Chicago SunTimes includes a photo of Corey McClaurin, a Simeon High School student, who was shot last Saturday as he sat in his car. He was described as a "diligent, well-liked student." This map shows where this shooting took place. It also shows that there are a large number of poorly performing elementary schools in the area, and no non-school tutor/mentor programs serving junior high or high school students operating near Simeon High School or anywhere in this part of Chicago. 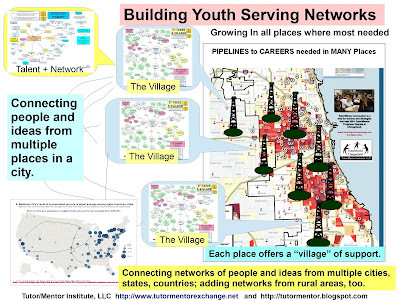 We created this map using the Chicago Tutor/Mentor Program Locator. 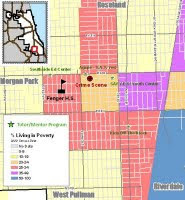 You can use that site to create your own map, showing poverty and poorly performing schools in this neighborhood, or any other neighborhood of Chicago. On page 14 of today's SunTimes is another story, this time about how students from Elmhurst College, in Elmhurst, Il., " took to the streets" in the Austin neighborhood to pass out flyers for an "anti violence" ralley hosted By the Rev. Michael Pfleger and the Bethel Green Family Worship Center. This event was "organized as a way to foster a sense of personal responsibility toward the issue of neighborhood violence," said The Rev. Ronald Beauchamp, pastor of Bethel Green and director of Elmhurst College's Nieburhr Center. A couple of weeks ago I wrote an article and posted some maps showing the Austin neighborhood. I wonder if the group at Elmhurst or the faith leaders in Austin have seen these. We've written articles on our blogs about engaging universities. You can read some here, here, and http://chrispip.blogspot.com/search/label/engaging%20universities. If you read other articles on this blog, you'll see that we view poverty as the root cause of poorly performing schools and disaffected youth who are willing to take lives without any form of regret. We agree with the student from Elmhurst College who was quoted as saying "Am I my brother's keeper. Yes." However, until people who don't live in poverty are engaging in an on-going way with information that helps them understand where and why kids in poor neighborhoods need more help, and teaches them that solving social problems requires a lifetime of involvement, not just a weekend visit or a semester of study. Furthermore, until people who don't live in poverty look in the mirror at the beginning of each day and ask "where can I give some of my time, talent and dollars" to help someone working in a poverty neighborhood help a youth connect with an expanded support system, in the school, and in the non-school hours, we will never have the consistent flow of resources in Austin, or the Simeon High School neighborhood, or any other high poverty neighborhood, to build and sustain programs that change the future for the kids living in these areas. What a volunteer-based tutor/mentor program offers is a place to connect, and stay connected for many years, with the kids who live in poverty, and the knowledge that they need to understand in order to have a greater personal impact, and a greater impact on others who need to be involved. Elmhurst is one of the Associated Colleges of Illinois, where there is a strong liberal arts curriculum. Many of the schools, were started by faith based organizations, such as Illinois Wesleyan, North Park, and Wheaton College, and continued various forms of faith based learning. Some strong. Others less so. Our "scripture" and "learning curriculum" is the information we host in web libraries and discuss in blogs like this. We need people to be reading and reflecting on this every day, just as much as leaders of faith communities, and universities, want people to read and reflect on their material. 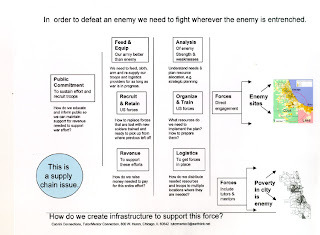 We need people to be using maps, diagrams, and other visual tools to create understanding, and to distribute attention and resources to all of the poverty neighborhoods, not just one or two. I know I am a voice in the wilderness on this. However, every time a youth is shot and the media print a picture and tell how this was a "kid you would wish for" we are reminded that we need to do more than wish to solve this problem. 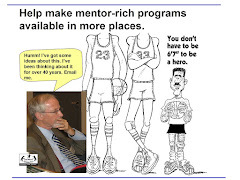 In 1993 the Tutor/Mentor Connection began creating a master database of volunteer-based tutoring and/or mentoring programs. You can now find this information in an on-line program locator which is linked to Google maps so you can search by sections of the city to find what programs, if any, are in different zip codes. Building this information, and producing advertising that draws volunteers and donors to tutor/mentor programs offers two different challenges. The T/MC has never had money to advertise, so we worked with media partners, such as Public Communications Inc, and Chicago Access TV, to help get stories to the media, and our information on TV. We launched a Chicagoland Tutor/Mentor Volunteer Recruitment Campaign in August 1995, aiming to help programs get volunteers as school is starting, and Chicago Access TV became a partner, enabling us to post program listings on the TV42 bulletin board, and publishing the promotional video shown below on TV 27. We need more partners like this, who every day will tell the story of tutoring and mentoring and one or more places in Chicago, and always show that good volunteering is supported by good funding. 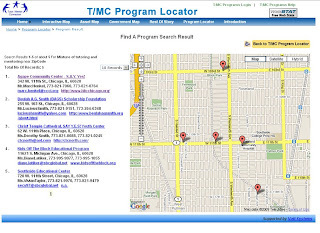 By pointing to the Chicago program locator with each story we can assure that all programs are getting the resources they need, on a more consistent basis. Read more about funding needs of tutor/mentor programs on Nicole White's Blog. Learn more about donating to Cabrini Connections, Tutor/Mentor Connection here. We're in a war against poverty. But we're not using all the tools and knowledge that is available to us to win this war. Below is one of many graphics I've created to stimulate thinking and involvement by many people, in many places, in long term strategies that lead kids from a birth in poverty to the beginning stages of jobs and careers by age 25. I struggle to explain the role of the Tutor/Mentor Connection, and to find flexible operating dollars to support your role. My solution is to point to articles that others have written that help people understand these concepts. Our challenge is to motivate decision makers to find time to read and reflect on these. I encourage you to read through this one. This is an article from a blog titled "How to Save the World". The writer, Dave Pollard, lists ten things to remember about complex adaptive systems (which include all social and ecological systems). Think of the role of the T/MC as an information resource, network builder, and mentor to you and others as you read this list. The T/MC does not seek to be the leader, with everyone following us. We seek to be a platform supporting the decentralized leadership and involvement of leaders throughout the Chicago region, the USA, and the world. If these ideas resonate with you, and you want to see kids move more successfully through school to careers, I hope you'll provide time, talent and dollars to help us, and that you'll apply these ideas in your own leadership, where ever you are. On the home page of their web site, they answer a question I was asking, and that you may be asking: What is What is Resilience? "Resilience is both an individual’s capacity to navigate to health resources and a condition of the individual’s family, community and culture to provide those resources in culturally meaningful ways." In their understanding, resilience requires that individuals and communities be supported in the development of their capacity to find resources that bolster well-being, while also emphasizing that it’s up to families, communities and governments to provide these resources in ways individuals value. In this sense, resilience is the result of both successful navigation to resources and negotiation for resources to be provided in meaningful ways. In other words, the individual and family have responsibilities, but so do communities and governments. This is really important stuff to me because it reinforces the concepts of the Tutor/Mentor Connection. If businesses, philanthropy, government, faith groups and universities don't provide places close enough to kids to participate, with age appropriate mentoring and learning, it's difficult for youth and families to overcome the obstacles present in their communities. Right now there don't seem to be many public or private policies that distributed needed operating resources to all of the high poverty neighborhoods of Chicago or the world, on an ongoing basis so that needed supports would be available in anywhere close to the level needed for most youth and families to climb out of poverty. 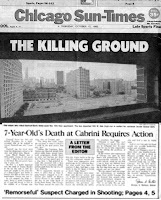 As this front page editorial from 1992 says, "7-Year-Old's Death at Cabrini Requires Action." The editorial writer goes on to say "This isn't something you can let the other guy be indignant over. It's past time for you to take responsibility for solving the problems of Chicago. Please don't let this be someone else's problem. It's yours. It's mine." This was written before the internet. Now we have the potential to mobilize individuals and organizations from throughout the world to respond to this call to action. I hope one of those is YOU and people you know and that you'll use the resources provide on this blog and the links to support your understanding and your involvement. Catalyst Chicago issues a report today with the headline, Chicago high school test scores stall, including those at transformation schools. In a forum hosted by Catalyst Chicago, research was presented which suggested that getting more adults and learning opportunities in the lives of kids attending poorly performing schools, or more social capital, can have a positive influence. Making tutor/mentor programs available in these neighborhoods, starting with elementary school, and staying involved through high school, is a way to build these connections between volunteers and youth. The map below shows locations of tutor/mentor programs in Chicago, locations of middle schools, and high schools, on the 2008 Illinois State Board of Education low performing list, and the poverty levels of different parts of Chicago. 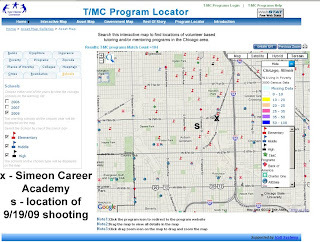 On the Program Locator you can turn layers of information on and off, so you could just look for programs serving high school youth, or elementary school youth, or doing pure mentoring. The map below illustrates how you can zoom into a section of the city to take a closer look at a neighborhood, and the availability of tutoring and/or mentoring programs. In the Asset Section of the Program Locator we've put in layers of information for banks, insurance companies, drug stores, faith groups, hospitals and universities. You can turn these on, and off, to create an understanding of the assets in a neighborhood who could be working with educators and non profits to build a wide range of mentor rich tutoring/mentoring and workforce development programs. On this map, we also show that I-55, the Stevenson Expressway, spits the neighborhood, bringing thousands of commuters through this area as they go to and from work and homes every day. With innovative leadership from the "assets" and leaders in this part of the city, many of these commuters could begin to become volunteers, donors, advocates, talent, and partners of tutor/mentor programs and schools in the neighborhood. These ideas are shared in a section we call Tutor/Mentor Institute. We try to help you understand these ideas with the blog articles we write on this blog, and on other blogs hosted by Cabrini Connections, Tutor/Mentor Connection. We've been a small voice in a huge city for more than 16 years, building and maintaining this knowledge base, so anyone can get involved in trying to help Chicago area kids successfully move through school and into jobs and careers. The Tutor/Mentor Connection is not funded by the city, state or federal government and has received no money from Chicago Public Schools in the past five years ... and very little before that! We depend on YOU, the people who read this blog, and who use the information, to support our efforts because you want the same results that we want. You learn ways to donate to us by reading our fund raising blog or by using this form. Don't let our light go out because we can't find the dollars to keep it burning brightly. This blog article by Ben Sheldon provides an excellent overview of various types of information visualization and mapping tools. Visit the Tutor/Mentor Program Locator and Mapping for Justice Blog to see ways we apply some of these ideas. Visit the maps links on this blog to see other ways we are mapping ideas. To do this work we need volunteers who can help communicate ideas visually, and with words and we need donors who will pay for staff, space and technology. Can you help? Contribute here. Getting to college not the goal. Finishing college is. In one of my Linked In groups this article on the failure of colleges to graduate the students who enter as freshmen was posted. This is tremendously important because it points out one more disadvantage that poor kids, the ones we work with at Cabrini connections, have in completing college and competing for good jobs and careers. Tutor/Mentor Leadership and Networking Conference in Chicago, November 19 and 20. The biannual Tutor/Mentor Leadership and Networking Conference is part of an ongoing effort to improve the quality and availability of tutor/mentor programs in areas of Chicago with high concentrations of poverty. Through the Internet, this conference connects program leaders in Chicago with people and ideas across the country and the globe. 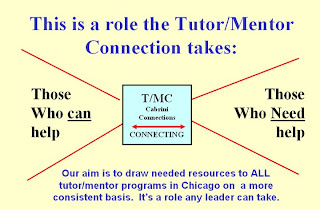 The Tutor/Mentor Connection (T/MC) first held the conference in 1994 after a survey of Chicago area programs revealed that more than half had little or no contact with other programs. Based on positive response from the first conference, T/MC decided to host a second conference in the same year, which attracted nearly 200 attendees. Since then T/MC has continued to host the Conference twice a year and believes that the event can grow to more than 500 participants. 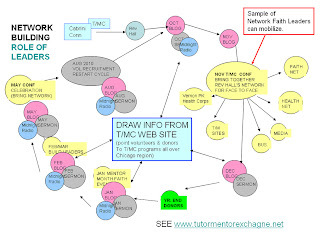 As Social Networking capacities have grown on the Internet, the T/MC has added on-line forums to encourage conference participants and others who cannot attend the Chicago conferences to connect and collaborate on-line. The next conference will be held on November 19 and 20 at Northwestern University in Evanston, Ill. We’re now putting together the workshop schedule and want to invite any of you who are interested to offer ideas for workshops or panels that you are willing to present. We already have a few speakers and workshops committed and will be posting those on the http://www.tutormentorconference.org web site by the first of October. However, we’d like to have your help in filling out the schedule. See the list of participants from the past four conferences at this link. This is a grassroots conference, and all speakers donate their time. In return, they receive free admission to the conference for the day they are speaking. We encourage speakers to be participants in as many workshops as possible to take full advantage of the networking and learning. Help us keep this service available and free to users. Cabrini Connections, Tutor/Mentor Connection is a non profit, just like all of the rest of the organizations that we try to connect with each other. Like you we’re searching for donors to help pay the bills. If can help find donors to sponsor the conference costs, or to help fund the work we do, please introduce them to us. College Bound, No Doubt About That. At Cabrini Connections, and hundreds of other places in Chicago and other cities, volunteer and student orientations are being held this week, and during the rest of this month, helping new and returning members get set for another year of tutoring/mentoring. I hope that you'll take a look at this video, created by teens and volunteers at Cabrini Connections. It summarizes our goal: "College bound, no doubt about that." Some of the students who created this have now finished college. Others are still trying to find help, but now they may be starting their own families, too. While we have a great turnout of volunteers, the glue that keeps this program together are the few people who serve as paid staff. Without finding the dollars to attract and reward these leaders, there is little year-to-year continuity in these programs. Without finding dollars for insurance, background checks, rent, there is no space to meet. While we seek grants, and we are reaching out for donations (see list of recent donors), this is the time of year when workplace fund raising campaigns are kicking off in companies and public institutions, such as Chicago Public Schools. Payroll giving allows someone to have a small amount taken from their pay check each week, which is then forwarded to the charity they designate. A $1 a week can add up to $52 a year. Once people begin to give through the workplace, most keep giving. Thus, this can be a consistent source of revenue for a non profit. Some companies allow associates to designate where their donation goes. Abbot Labs, Allstate, Microsoft and Sargent Lundy are a few companies where employees have been choosing Cabrini Connections. If you know people working at these companies, show them our video, and encourage them to select Cabrini Connections this year. On the other hand, most public institutions and companies use the Combined Federal Campaign, and the United Way Campaign. 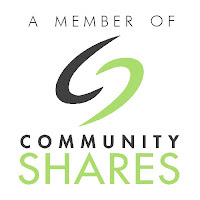 Cabrini Connections is listed with the Black United Fund of Illinois in the campaigns they organize and the Tutor/Mentor Connection is listed with Community Shares of Illinois in their campaign. If you work at one of the places where these campaigns take place, gather a few associates and show the videos we have on our web sites. If you're a volunteer, or an alumni, tell people of your role. You can help us raise the money needed to support what happens at Cabrini Connections, just by encouraging others to give through workplace campaigns. If you're in another non profit, you can be doing the same thing we're doing. Ask your volunteers and your students to evangelize the work you are doing so you are not staved for the dollars you need to keep doing it. On Monday evening, Channel 2 News did a story about Cabrini Connections. You can see it on their web site. The story focuses mostly on the Cabrini Connections side of our work, connecting youth and volunteers with each other, and extra learning and enrichment opportunities, such as arts, video and technology. Not much was told about the second part of our mission, which is helping programs like this be available to kids in all poverty neighborhoods. That's the role the Tutor/Mentor Connection takes. The story was filmed a week ago, on 8/30/09, and the message "we're broke" was accurate at that time. We were only able to pay half of the weekly payroll because of lack of cash. However, last Friday, 9/4, we received a $35,000 grant from HSBC North America. As we start this week, we're not as bad off as we were, but the main message of this story, and of blog articles I've written in the past few weeks is still true. Unless we find one or two major benefactors, who will make a multiple year commitment to helping us continue Cabrini Connections, Tutor/Mentor Connection, we may not be here in the future. At the same time, we need to keep the donors who have helped us since 1993 and who are still sending contributions of $25 to $500 to help us. It does take a village to raise our kids. I hope you'll help. In a recent article, Larry James, President and CEO for Central Dallas Ministries, writes, "Recently, a good friend pointed out the hard, but obvious, truth that every non-profit must almost completely recapitalize itself every year in order to carry on its work. Take it from me, that is a tall order." He goes on to say, Those who work among "the poor" long enough and with enough "success" sooner or later recognize the need to influence and adjust the systemic forces that contribute to the creation of poverty and to the conditions that keep people living with less than they really require. If we want to keep putting band aids on these problems, we'll still be doing this fifty years from now. If we want more in-depth solutions, we need more consistent, flexible investment from the people who have the resources, and who want to see a different future. I encourage you to read the analysis of the Tutor/Mentor Institute written by Bradley Troast, who is the 2009-10 NUPIP Fellow with Cabrini Connections, Tutor/Mentor Connection. This diagram shows the role of most consultants who provide knowledge that helps a non profit connect with ideas and resources that help the non profit, or the for profit, do its work. The Tutor/Mentor Connection has been providing a wide range of services intended to help volunteer-based tutor/mentor programs throughout the Chicago region, and in places as far away as Africa and Australia. Other than charging a small fee to attend the Tutor/Mentor Conferences in May and November (and we give scholarships to all speakers and anyone who requests one), we don't charge anyone for the help we offer. This diagram describes the way we've been working. Rather than be in the middle, charging a tariff for information to go back and forth between those who need help, and those who can provide it, we've moved from the middle to a third point in a triangle. Our information is intended to be used by donors, volunteers and public leaders, just as much as it is intended to be used by tutor/mentor program leaders, families, youth, social workers, etc. If we worked like a traditional consulting firm, we'd only help those who could pay. 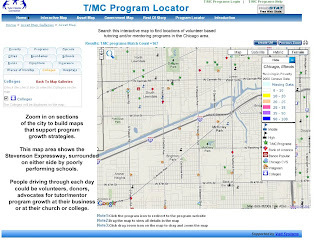 That means, instead of trying to show all of the tutor/mentor programs in Chicago on the Program Locator maps, we'd only show those who were paying for the listing. Those with the least resources, and in the poorest neighborhoods, would be the ones who could least afford our help. Yet, they are the ones who need it the most. Thus, we've kept our services free, depending on donors who value what we do, and want the same outcomes, to provide the operating and innovation dollars needed to provide our services. That has not been easy because some donors have gone out of business and others have had funding guidelines that limit how long they can fund us. Others just don't see the value of an intermediary, and can't see metrics that help them understand what we are accomplishing. Use the touch test, sight test, the taste test, or the smell test. If you can see it, use it, touch it, then it's there. Skim through the links on this blog and you'll see resources that we have created. This is not a mirage. It did not happen by magic. It has taken many years of effort. Yet, it is there for all to see, and all to use. There was no T/MC in Chicago prior to 1993, and in most other major cities most of the intermediaries are still charging a fee for you to get their help. 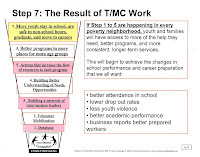 There are no other organizations doing all of the things the T/MC is doing to try to help volunteer-based tutor/mentor programs grow in EVERY neighborhood where they are needed. Bradly is posing some questions for how we continue this service when donors have less to give and a major champion has not yet come forward to provide the ongoing operating and innovation dollars needed to keep this service in Chicago, and FREE to those who need it most. Take a look at the designs for the new Tutor/Mentor Connection web site. You can see it live tonight at 9:30. I ended the session saying "Give me $1 million a year for 10 years and I can do a lot more than they can with $30 million." CPS plans to spend $30 million on helping kids at risk. Why not help tutor/mentor programs do that work? I encourage you to read Nicole White's (T/MC employee) blog about today's story in the Chicago Tribune about Chicago Public Schools' plan to spend $30 million to help at-risk students. It would be great if the CPS had a strategy like the T/MC to engage business and professional volunteers to help tutor/mentor programs all over the Chicago area. It would be even greater if they would use the information on the T/MC web site to build their strategy, or if they would invite us to be part of their planning. Our strategy has been on the web site for a few years, and we have many CPS employees on our email list. We've not charged them a fee to look at this. It would be even greater if they provided some money, or helped us find money, to help tutor/mentor programs grow in all parts of the city. Or if they encouraged business and professional people to build strategies that encourage employees to volunteer time, talent and money to non-school tutor/mentor programs in different parts of the city, using the information on the T/MC library as resources to support such involvement. That might be too much to ask. We're only talking about the future of our kids. If they want to use this resource, they better do it soon. We don't have much money to keep this service in place for much longer. Someone from the Chapin Hall Center for Children at the University of Chicago once wrote, "what would a Chicago without the Tutor/Mentor Connection be like". Hail Mary needed to win game! Any football fan knows what a "Hail Mary" pass is. It's a last minute throw into the end-zone to score a game winning touchdown. That's what Cabrini Connections, Tutor/Mentor Connection needs right now to help us stay in the game of tutoring/mentoring. Our finances are low and we're "stretching the field" to find leaders who want the same results we want, and are willing to put their time, talent and dollars into making it happen. Read El Da'Sheon Nix's Hail Mary blog article and see if you can become a receiver, or a Quarterback. What do we mean by leaders? I encourage you to read this article on Catalytic Philanthropy, and then read this article on Role of Leaders, created by the T/MC many years ago. We and other volunteer-based tutor/mentor programs won't need Hail Mary passes to stay alive when more people in business, philanthropy, government, religion and higher education take on the leadership roles described in these articles. As that happens, we hope you'll value the Tutor/Mentor Connection as a resource, and an innovator, that you'd want to have included in your learning, brainstorming and strategic thinking. There are two discussions on the Mentor Exchange forum that I encourage you to visit. One is titled "Getting Realistic about Funding Non Profits" and focuses on the infrastructure costs that are essential to building great businesses, but which are terribly underfunded in non profit organizations. Read the article titled The Nonprofit Starvation Cycle, by Don Howard, Ann Goggins Gregory. I can't tell you how often I look at the guidelines of potential donors which say "we don't pay for salaries". How would a business operate if there were no people on staff? Yet, that's what many grant makers seem to expect. If volunteers,leaders, board members, donors, policy makers can read the same information, and view shared actions toward common goals, maybe we can move more consistently toward the real work of helping kids.